Back in September I presented the Music by the Metre project at If Wet, the makers’ and musicians’ show-and-tell series in Worcestershire organised by MortonUnderwood. This fantastic series of events is coming to the end of its first season and needs to raise some funds to continue. As such, their season finale will feature an auction and compilation, to which I’m donating some work. During my presentation at If Wet I recorded a new Music by the Metre piece and documented the build with Polaroid photos. The If Wet compilation will feature a digitised version of the piece. For the auction I’m donating two pairs of framed Polaroids, taken on stock which was ten years past its use-by date. 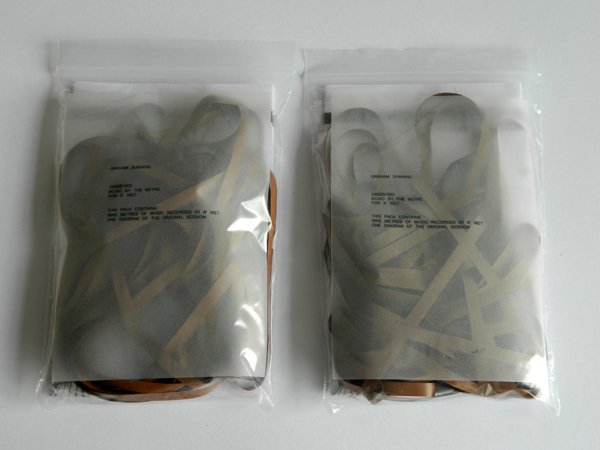 I’ve also prepared some bagged-up Music by the Metre – the original tape recording split into ten batches of nine metres – each of which come with a numbered photocopy of a diagram of the very first Music by the Metre set up.